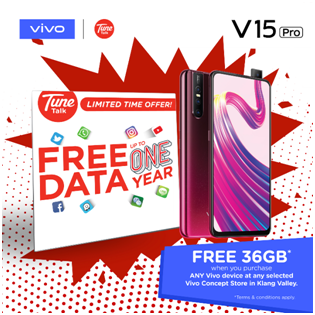 Starting from today, you may purchase any Vivo smartphones at any selected Vivo concept store in Klang Valley and enjoy FREE 36GB Data for one year exclusively from Tune Talk. Vivo recently launched V15 series in Malaysia while V15 is selling at RM1,399 and V15Pro is selling at RM1,799. Both of the phones are equipped with the world First 32MP Elevating Front Camera and provides an Ultra FullView Display screen. The Ultra FullView Display avoids the notch from the screen and brings you an ultimate view. Other than that, V15 series packs with an AI Triple Camera that creates an upgraded experience of taking professional photography with just a click. The 120° AI Super Wide Angle Camera expands your view to 120 degrees, so you can include more people in your shots, snap more of the most beautiful scenes, and capture a more stunning world from a wider perspective. Moreover, V15Pro and V15 both comes with 6GB RAM and 128GB storage. It lets you enjoy smooth gameplay and run multiple apps simultaneously. 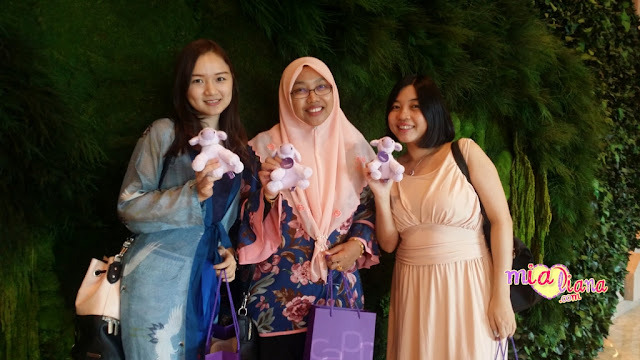 For more information, please visit official website of Tune Talk and Vivo Malaysia on Facebook, Instagram, Twitter and Youtube.